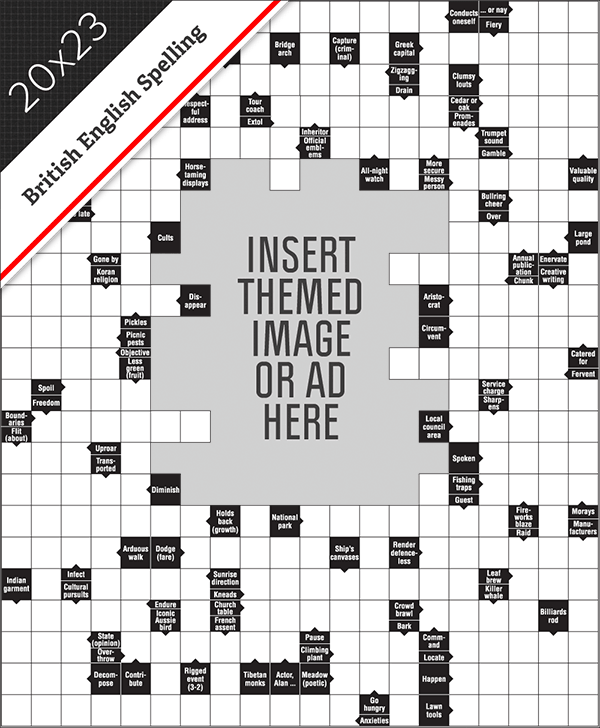 20x23 portrait layout clue-in square crossword using British English spelling. There's a space in the middle of the grid into which you may insert an image. Find the clues in the 'black squares'. The arrows tell you which space the clue applies to. The answers to clues are written from left to right or top to bottom. If you can’t answer the first clue, scan the other clues until you find something you might know. You can then work from there. Once you fill in an answer, those letters will help you to answer the clues to the intersecting words. If a clue is plural, the answer will be too and if the clue is past tense etc, so will the answer be. In most cases, you can guess that a plural will end in S and a past tense will probably end in ED. If there are brackets holding numbers after a clue, this indicates the number of letters of the word or words in the answer. E.g. ‘Famous portrait (4,4)’ indicates the answer is two words of 4 letters each; MONA LISA. Single non-exclusive use of the puzzle in a single publication. Lovatts Media retains full copyright of all material. Direct Download Now link appears when your payment is processed. You will receive two emails, an Order Confirmation email containing invoice details and a separate email including the download links.